A love of nature, art, craft, fresh air, clean water, beautiful landscapes, people, different cultures and great food have all shaped Rosie’s life. Setting up Wild Rose Escapes and living in Crochail woods has been driven by all of these. Rosie studied archaeology at the University of Liverpool. Her interest in archaeology, anthropology, people and travel lead to her working as a tour leader, taking groups to beautiful places in Africa and Asia. Her and Alex’s shared interest and knowledge of traditional and prehistoric life has gone beyond just studying the past for its own sake and has come to shape where they live and what they do. Food has always been a big part of Rosie’s life, be it wild food foraging or rustic home cookery for friends, family and, later on in life, commercially. It was a cooking job which first brought her up to the Highlands. She took a job at Cape Adventure, a remote outdoor activity centre in Sutherland, where Rosie developed a love of the Highlands, especially its amazing landscapes and the many interesting people who inhabit them. Rosie inherited a flair for artistic creativity from her mum and has always practised a wide range arts and crafts. When she moved up to the Highlands, wool became an obvious medium due to the long traditions of its use in a range of applications and its plentiful availability. A love of plants and nature then lead her to learn more about natural plant dyes. 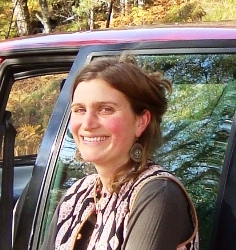 Rosie studied Therapeutic massage at the Glasgow school of holistic medicine in 2004. She had previously spent several years as a support worker, with people experiencing mental health problems, homelessness and young people with behavioural issues, and wanted to develop a more hands on way of working with people. A combination of everything Rosie knows and loves, people, cookery, nature, traditional crafts and wild spaces, has been used to create Wild Rose Escapes. Alex’s CV suggests that he might have a low boredom threshold! He read archaeology at Southampton & has worked on projects in southern England, Denmark & the Outer Hebridees. He has trained in traditional building techniques and has reconstructed an iron age roundhouse and restored a 400 year old chalk cob cottage. He has worked on all sorts of farms, in the UK & Australia, including ones producing fruit, organic chicken eggs, game birds, sheep and beef. He has also designed, created and maintained gardens. Alex has worked as a cook everywhere from a vegan restaurant to a roadside grillhouse and from Highland Lodges to music festivals. He has sailed on old wooden boats since childhood; serving as mate on the Joile Brise during Tall Ships races and as bosun on the Mariquitta when it was relaunched (as the largest single masted traditionally rigged vessel afloat) and then raced to overall victory on the Meditteranean classic regatta circuit. Alex is at his happiest when he’s got mud under his nails and saw dust in his hair, subsequently he now spends most of his time somewhere in Crochail Wood, making it a nicer place to live if you’re a red squirrel or a native plant or tree. He helps with many different elements of our holidays, but is mostly in charge of looking after baby Thora! Catherine is keen knitter and enjoys spinning. She runs travelling yarns, which is her online shop where she sells beautiful Scottish yarns. Catherine runs the spinning demo on our Fleece to Felt weeks, we also sometimes visit her at home if guests are interested in buying wool and patterns. 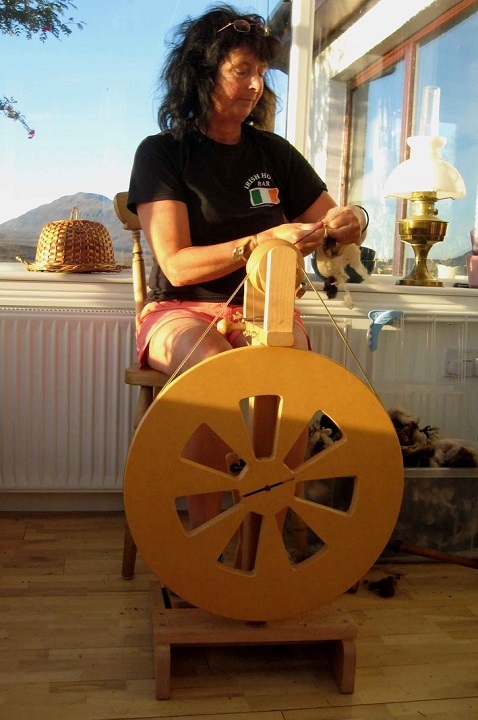 Bridie lives in Elphin which is north of Ullapool and has been teaching spinning up there and all over Scotland for over 20 years. She lives on a croft which used to be the Elphin rare breeds centre, which Bridie ran with her partener. She has a passion for sheep and most animals. Bridie runs the spinning part of our Dye hand spin to week. “I have been hand-spinning wool since the ‘80’s, much to my pleasure- and able to create products to sell from our croft. We have bred various Scottish sheep over the years, and I now use our Shetland fleeces that have been improved by careful flock management, using the simple teasing process: to make softer and finer clothing. I enjoy instructing & encouraging others to use wool, discovering their own flair for texture, & eye for quality. The landscape & ambience here recalls ancient patterns, with little hubbub interference, it allows for contemplation & design exploration”. Craig like Ele helps us with anything and everything when he can. 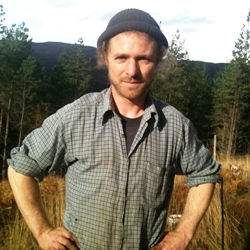 Craig spends time between working at Abrichan forestry trust, working in the woods and playing music. Ele lives here in Crochail woods with her partner Craig and son Oran. Ele helps us with all aspects of Wild Rose Escapes and life in general! Ele can turn her hand to anything, she is a qualified outdoor instructor specialising in kayaking, a brilliant cook, very green fingered and she sings and plays the whistle. You will find her washing fleeces and happily poking dye pots over the fire throughout the year. Ele and Rosie also run Wild Rose Makes together, making and selling their needle felting kits and eco printed silk scarves. 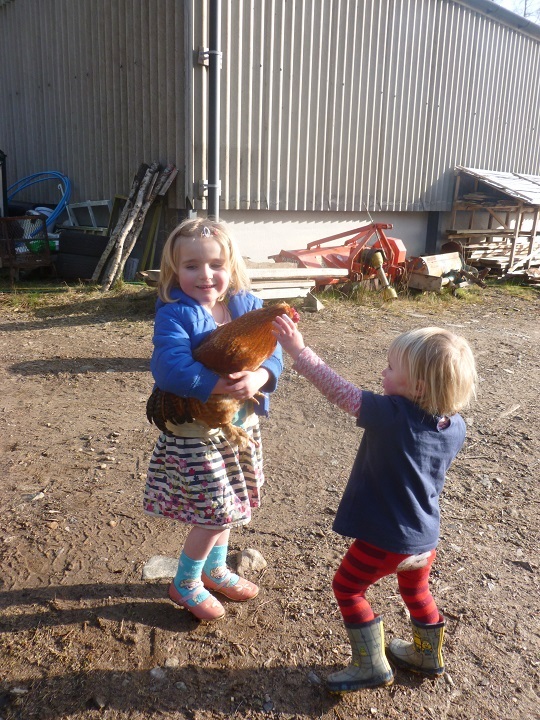 The girls can mostly be found catching chickens, dressing up or trying to help daddy somewhere!